If you wander down to the Cambridge Farmers' Market on a Sunday morning, be sure to stop by Cam Cattle. 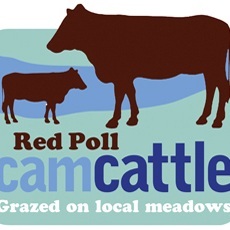 Their beef raised in Cambridge’s commons and meadows, where they are free to wander, sleep and eat as they please. They provide conscientious consumers in Cambridge the opportunity to see the high quality of the cattle’s life first hand.